Henry - August 4th, originally uploaded by joyful.life. I don't know about you, but I love Henry art. These fun and whimsical murals seem to pop up every so often here in our lovely city and honestly I can't complain. I'm always excited when I just happen to pass one. This one in particular is on the North side of Leary as you head into Ballard. 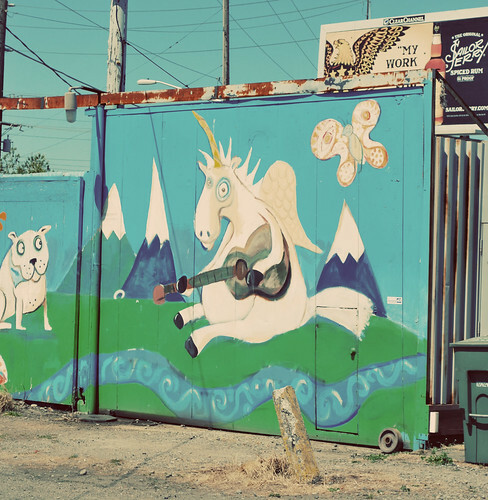 The building it graces is nothing special, but this mural of a guitar playin' unicorn...with a white dog audience...somewhere in the mountains near a babbling brook...is just...well...sweet. Do check out Ryan 'Henry' Ward and his cast of whimsical characters. You never know where you might see him next! And, if you're in the Seattle area and happen to have any type of blank space that needs some color, DO give him a call. It will help him to get one step closer to his goal...50 murals in different neighborhoods across Seattle. That sounds quite doable, don't you think?